How much do you know about your purchased iTunes Store content? Do you know how to access your purchased content from any iOS device? Read this article to figure it out in minutes. Download and install PhoneRescue to recover your lost data after reading this post on how to access your iTunes store purchases from any idevice. After you have purchased an app, music, a movie or some other type of content from the iTunes Store, that content is automatically available via iCloud to all your iDevices linked to your iCloud account. 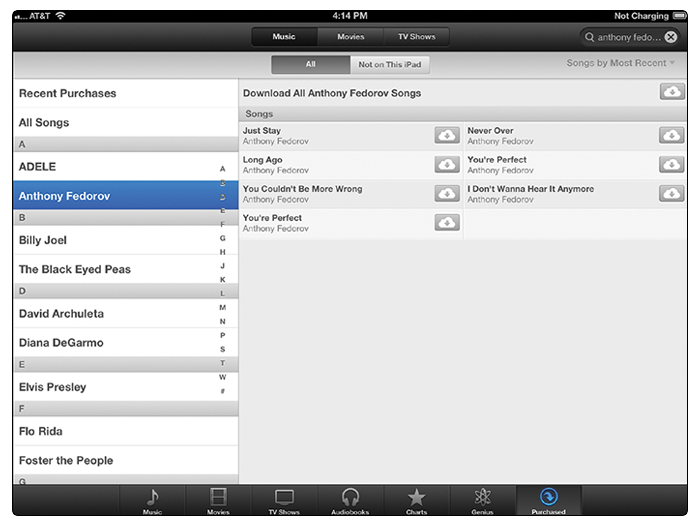 Do you know how to view iTunes purchases from any of your iDevices? This article helps you a lot. Make sure that your iDevice is connected to the Web via a 3G/4G or Wi-Fi connection. Launch iTunes on your device. If prompted, use the virtual keyboard to enter your Apple ID password once the Apple ID Password window pops up on your screen. Tap on the Purchased icon that's displayed near the lower-right corner of the iTunes' screen. Then, near the top-center of the screen, tap on the Music, Movies, or TV Shows tab. On the iPad, within a column on the left side of the screen is an alphabetic listing of recording artists and music groups, or TV Shows that depends on which category you selected before. Note: On an iPhone, to access iTunes purchases, launch iTunes , tap on the More icon that's displayed near the bottom-right corner of the screen, tap on the Purchased option, select Music, and then choose the artist or group's name whose music you already own and that you want to download onto the phone. On the right side of the screen, all songs, movies or episodes pf TV shows that you have previously purchased and that are stored in your iCloud account are listed with an iCloud icon. Tap on the iCloud icons, to select which content you want to download onto your iPad. Launch the Music or Video app on your iOS device to view your content. If you lost your important data accidentally, you can download PhoneRescue to recover all of your lost data easily.